Two lemons in a bowl. Paintings availaible on Ronell’s art under NEW PAINTINGS! Two mugs, three plums and figs in a bowl oil paintings. I have come to enjoy these little still life oil paintings. *Paintings availaible on Ronell’s art under NEW PAINTINGS! February art: kohlrabi and black spanish radish. Vegetables are always a good idea. To sketch. The winter vegetables with their bland colours aren’t always that exciting to paint, but in that fact lies the challenge. It is easy to splash the reds and yellows in summer foods, but what with the black and beiges of winter root vegetables. for this exercise I chose kohlrabi, not a vegetable I particularly like eating and black Spanish radish. Kohl rabi and black Spanish radish. 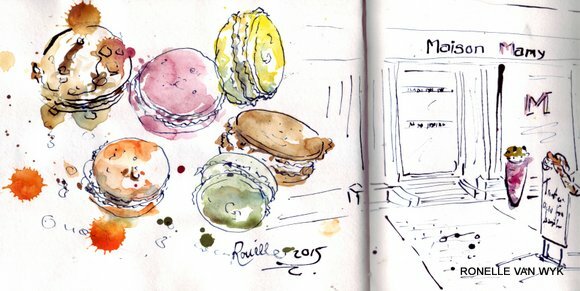 One of my favorite paces to lunge for my sketchbook, is in Cafe Douceur in Beaulieu sur Dordogne. Such a welcoming lieu, you keep drinking coffee just to have an excuse to linger longer. Every day in May – (1)a favorite food and (2)a tree. “A favorite food,” says the list of the art group EDM for this month of May.. Only one favorite food? That is a huge punishment! I can draw a favorite food for a whole month and even beyond. How then to choose between all my wonderful favorite fruits, the colourful vegetables, the meat…(yes, you Greenies, I love my meat!) And then there are fish and shellfish and how about a slice of cake? Or a cookie. And dessert. I never skip dessert. I won’t even mention chocolate and that first cup of coffee in the morning. Only one favorite food? However, I can sometimes play by the rules and this time seems appropriate enough to do so. So one favorite food it is. I confess my weakness for macarons. Those beautiful, sensual, romantic and utterly delicious delicacies our patisserie in Beaulieu so shamelessly flaunts in the display window. By just looking in my eyes, they know I am there for a box of macarons. Yellows and purples and pinks and reds which vary between red fruits and blueberry and strawberry and lemon and vanilla, chocolate, coffee, caramel and my big favorite, that green one, the pistache. I love them all. I leave the patisserie on an euphoric cloud and with my precious macarons gently tucked next to each other in a quaint box and artfully tied with a pink ribbon. All that is left now, is to nail this sketch, so I can retire with my box of macarons to my favorite chair in my favorite corner…..sigh. I rest my case. I can totally understand why there are nutcases walking around hugging each tree they come across. sometimes I am one of them. Cause a tree is not just a tree. It is a friend, it stirs our emotion, it is a refuge, that safe place under/or in its branches where we hide from all that scorches us..the sun, the world. The olive tree is all of that for me. I do hug my olive trees and talk to them, touch them, stroke them, care for them, love them. They make me think of sunshine and heat. They makes me hear the cigales. They bring me the scent of lavender and wild herbs in the fields and I see colourful vegetables drizzled with the golden oil from its olives, glistening with crystals of fleur de sel. That is my olive tree. I have been struggling with a fatigue for a few days…it may well be the change of seasons? 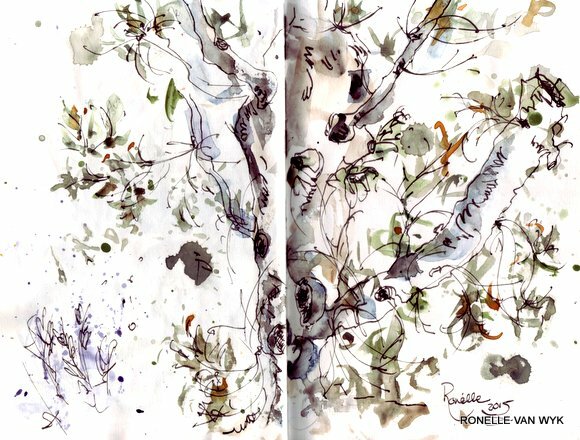 Just the thought of going out sketching already tires me..so I have been mostly in front of my table, fiddling with small sketches, moistly fruits and veggies, which is usually a good idea when all else fails. I’ve noticed that I have actually never done red peppers..which is surprising. Et voilà..some red peppers for today. ..red peppers in aquarelle on watercolor block, HP, 18cmx26cm..